The 2012 Big Boom Trap is a Limited Edition Tactical type weapon. A fine and attractive looking trap for any mouse who likes to have a good time, it is so attractive and dazzling in fact that when the volley of non-lethal BOOM! brand light-works whiz past them, the mouse is rendered immobile for minutes after from sheer awe at the beauty... Except of course when the hunter loads the fireworks volley with BOOM! brand high-incendiary fire-work rounds; in that case you definitely won't be finding a mouse at all. 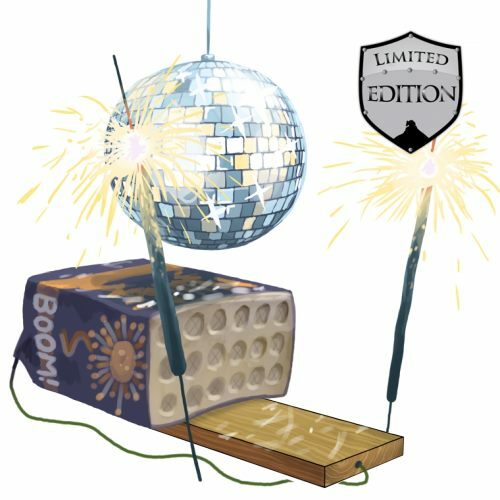 The 2012 Big Boom Trap is a Limited Edition weapon and can no longer be acquired by Hunters. It was available to purchase from the Festive Comet Trapsmith for 600,000 gold and 100 Firecracker Charms, and required that the hunter possess at least 600 Festive Toy Receipts. It could be refunded at the same location for 108,000 gold. 30 December 2011: The 2012 Big Boom Trap was introduced. This page was last edited on 13 January 2019, at 15:42.